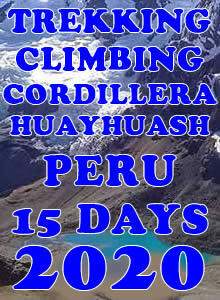 CORDILLERA HUAYHUASH TREK PERÚ 2019, Specialized in the Organization of Cordillera Huayhuash Trek Perú 2019, operators have a team of professional work experience in the field of tourism of high mountain, whose main objective is to provide quality, safety and warranty on all of our services, in this way, meet the expectations and demands of the customer. We will help you to organize your Tours program in bus, conventional Tours, Trekking, Climbing, hiking, climbing in the Cordillera Blanca and Huayhuash ice as well as in Cusco - Arequipa - Puno - Huaraz, Perú. * Max. altitude of trek Cordillera Huayhuash : 5.000m (Pass Cuyoc). * Difficulty : Medium to Difficult. * Duration : 11 Days. * Recommended season : May to November. 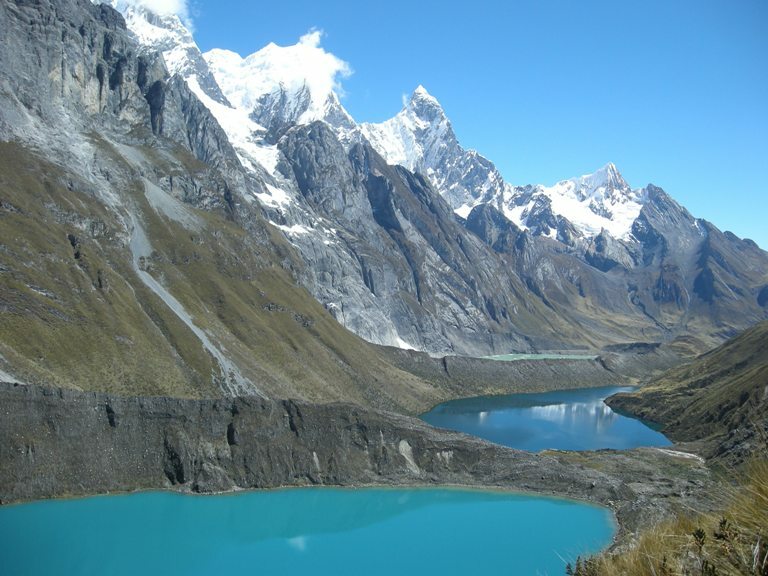 * Places to visit : Cordillera Huayhuash Park. 1st day.- Departure from Lima to Huaraz (by bus). Departure time from Lima is at 09:30am and we will arrive in Huaraz at 5:30pm. Pick up at the bus terminal and transfer to the hotel in Huaraz is included. The staff of "Enrique Expedition Tours" and the Mountain Guide will be informed about CORDILLERA HUAYHUASH TREK PERÚ 2019 your arrival and will be waiting for you. 2nd day.- Acclimation trek to Lake Churup (4450m). We will leave the city of Huaraz by private bus to Pitec (3850m). First we will pass the colorful villages of Llupa (3650m) outside of Huaraz, where we will have a panoramic view of the southern part of the Cordillera Blanca. Arriving in Pitec we start the hike to the Lake Churup at 4450m. First we enter the valley of Churup, after some hours of walking we will reach the Lake Churup, where we will stay for one hour before we return to our hotel in Huaraz. (Elevation change: +650m; Duration: 4-5 hours). The organization of personal material and logistical information for the TREKKING CORDILLERA HUAYHUASH, we will do after the trekking in the evening. 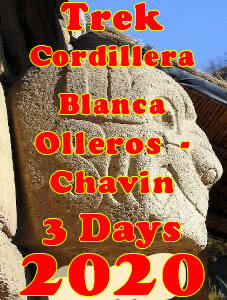 3rd day.- Huaraz (3100m) – Conococha (4050m) – Chiquian – Cuartelhuain (3900m). Pick up at the hotel and departure by private bus from Huaraz to Chiquian city (3400m). We will continue our journey towards Cuartelhuain (3900m), where we will be expected by our donkeys and donkey drivers to pack everything, so that we can start walking the next day from camp Cuartelhuain. (Elevation change: +800m; Duration: approx. 5 hours bus travel). 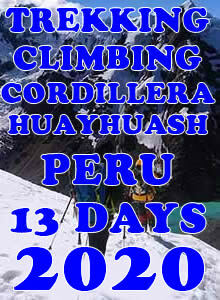 4th day.- Cuartelhuain (3900m) – Lake de Mitococha (4100m) – Lake de Carhuacocha (4138m). 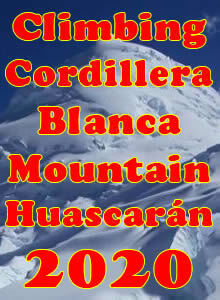 We will pass the first pass of Cacananpunta (4700m). We will observe some mountains like Ninashanca, Rondoy, the lakes of Pucacocha, Yanacocha Chico and Grande (small and big). Later by descending towards lake Mitococha we will get to see the mountains Rondoy and Hirishanca. We will continue our trekking and pass the second pass of Punta Carhuac (4650m) and descend through the ravine to our camp Carhuacocha. We will enjoy a panoramic view of the mountains Jirishanca, Yerupaja, Toro, etc. (Elevation change: +800m; Duration: approx. 6-7 hours). 5th day.- Lake Carhuacocha (4138m) – Pass Siula - Huayhuash (4100m). We will pass the third pass of Carnicero (4600m) and descend in between the lakes of Atocshaico, Carnicero. We will see the mountains Siula, Khural, Carnicero and Trapecio. (Elevation change: +462m; Duration: approx. 6-7 hours). 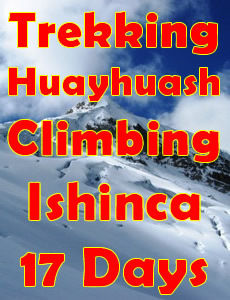 6th day.- Huayhuash (4100m) – Lake Viconga (4407m). We will leave very early to pass the fourth pass of Portachuelo (4750m). There we can see the mountains Puscanturpa, Cuyoc, Millpo and a part of the Cordillera Raura. 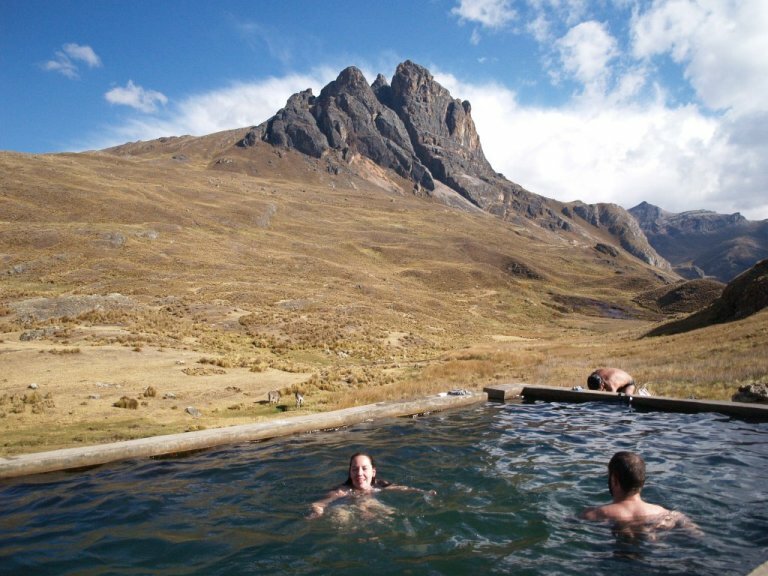 After we will arrive at our campsite in Viconga (4300m) you will have the chance to take a bath in the hot springs of Atuscancha (4000m). (Elevation change: +650m; Duration: approx. 5-6 hours). 7th day.- Lake Viconga (4407m) – Pass Cuyoc (5000m) - Pampa Elefante (3900m). We will pass the fifth pass of Cuyoc (5000m), the highest of the entire circuit. Descent through the ravine of Guanacpatay to the camp - Pampa Elephant (3900m). (Elevation change: +593m; Duration: approx. 6-7 hours). 8th day.- Pampa Elefante (3900m) – Lookout San Antonio – Huatiaj (4300m). We will leave the camp to climb up to the lookout San Antonio, where we have a beautiful view of the Cordillera Huayhuash. Later we will descend along the valley Guanacpatay to the village of Huayllapa. After visiting the village we will head towards our camp Huatiaj. (Elevation change: +400m; Duration: approx. 5-6 hours). 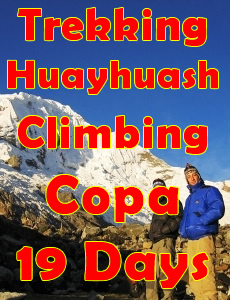 9th day.- Huatiaj (4300m) – Lake Jahuacocha (4100m). This day we will leave our camp to conquer two passes, Tapush (4900m) and Yaucha (4800m), to hike further towards lake Jahuacocha. 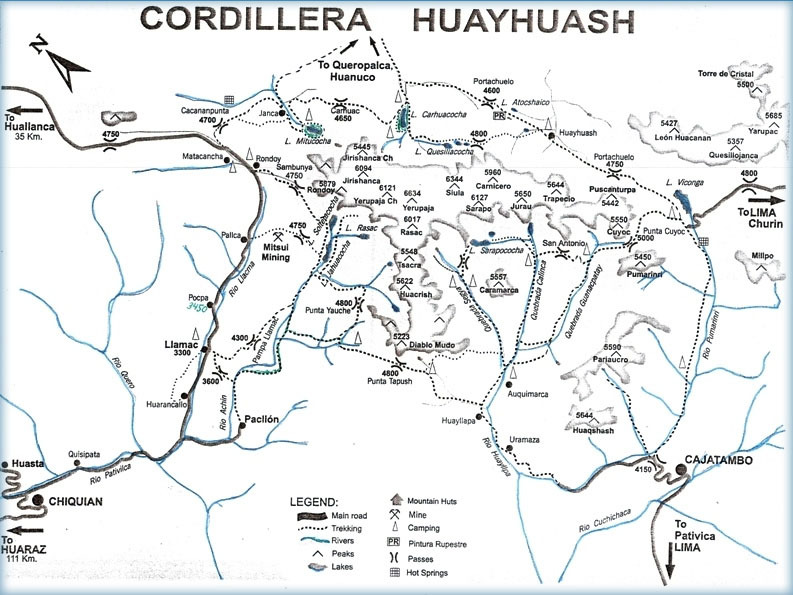 From there we will enjoy a panoramic view of a part of the Cordillera Huayhuash, including Yerupaja, Hirishanca, Butcher, Siula, Trapeze etc. Arrival at our campsite at Lake Jahuacocha (4100m). (Elevation change: +900m; Duration: approx. 5-6 hours). 10th day.- Lake Jahuacocha (4066m) – Llamac (3250m) – Huaraz – Hostal. We will pass the last pass of Pampa de Llamac (4300m). For the last time we have the opportunity to see the mountains of the Cordillera Huayhuash. Arrival at Llamac, where we will be expected by the bus company "Enrique Expedition Tours" to take us back to Chiquian and Huaraz (same way like the travel from Huaraz). (Elevation change: +234m; Duration: approx. 5-6 hours). 11th day.- Departure from Huaraz to Lima (Bus). Transportation from the hotel to the bus terminal "Cruz del Sur" and depature from Huaraz. The departure time will be determined by your schedule, in the morning or night. - 02 nights lodging in Huaraz, with breakfast. - Camping equipment (mountain tent, mattress). - Personal attention by "Enrique Expedition Tours"
- Donkeys to transport the personal equipment of the clients (10 kilos per person). * The meals include omelets, soups, fresh fruits, avocado, pasta, meat, rice (all rich in carbohydrates and suitable for the physical effort of trekking), hot drinks (including coca leaf tea, which is excellent for the altitude). Tea provided every day (tea, coffee, biscuits and popcorn). - Land transportation Huaraz - Pitec - Huaraz (Lake Churup). - Food and drink in the city. - Extra days of lodging caused of earlier arrival or delayed departure. - Sleeping Bag. (Preferably -14ºC). - Dear customers, we recommend making a reservation in advance, so that the price is more economical. 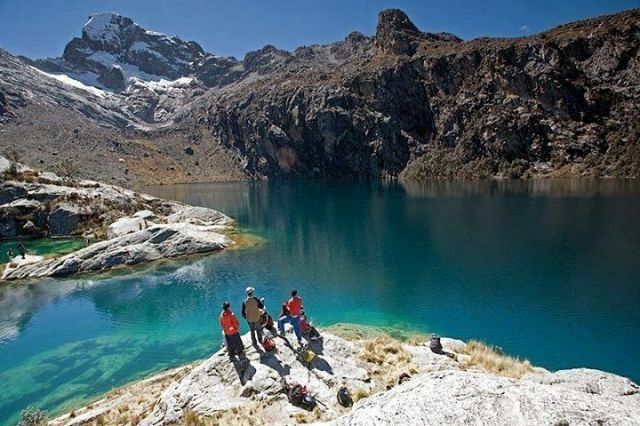 - This advance reservation is carried out 7 months before your arrival date to Huaraz. - The reservation is made with a deposit of 40% of the total price and 60% need to be paid upon your arrival to Huaraz (Office of Enrique Expedition Tours - Huaraz.). - After our company, "Enrique Expedition Tours" confirms your reservation deposit we will be sending via e-mail a voucher of the reservation confirmation, where we explain all the details of the itinerary follow upon your arrival to Huaraz. The money of the reservation will be deposited in a bank account of our travel and tourism agency, that we can access if you request. • Bus with 2 floors. • Seat belts on all seats. • Laser radar to detect objects on the road (up to 150m distance). • Internal video cameras (control of corridors). • Breakfast and/or lunch and/or dinner (depends on travel time). • On board Service (Attention of Land Slides). • Air conditioning and heating. • Bingo (prize is the return of the ticket). And the hours of the departure every day. - Lima - Huaraz: Departure 8:15am. – Arrival 9: 05am. - Huaraz - Lima: Departure 9:35am. – Arrival 10:25am. - All passengers have to arrive for any route of flight an hour earlier at the airport for their respective checked luggage. - LUGGAGE: Each passenger is entitled to 15 kilos of luggage (10 kilos for load and 5 kilos for carry on). If it exceeds this weight you are responsible to pay $1 per kilo (not including taxes). - The fare per person is $144.00 USA (subject to availability) For this service, "LC Peru" - HUARAZ communicate with us. • Trekking socks (synthetic fibers: Colmax ...). • Wool of Fleece Gloves. • Cap for the cold (fleece or other). • Thermal and microfiber shirts. • Quilted Anorak (down or fiber). • Waterproof jacket (goretex or other). • Waterproof pants (goretex or other). • Altitude glasses (with side shields). • Backpack of 70/80 l.
• Headlamp (with spare bulbs and batteries). • Sunscreen (lips and skin). • Sleeping bag for altitude (down). • Toilet bag and towel. • Rubber sandals (for taking showers/ crossing rivers/ taking a bath). • Bag with personal documents and money. Perú - Enrique Expedition Tours - 2000_Todos los Derechos Reservados.